The structure in which the face and back loop occurs along to the coarse successively but all the loops of a wale is same is called rib structure. The circular knitting machine which is used to produce the rib structures is known as rib machine. Creel: Creels are the knitting elements which carry the yarn packages to feed the knitting zone. 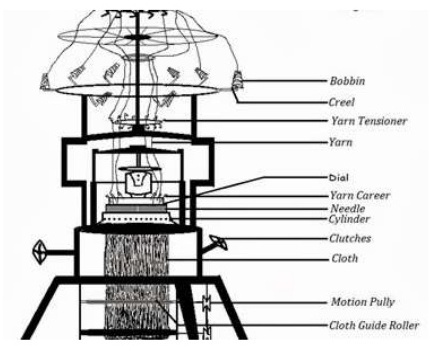 Feeder: The feeders feed the yarn into the needles hooks and control the needle latches in their position while the needles attain their position. Needle: It is the principal element of knitting m/c. The function of the needle to retain old loop & to receive the new loop. Fabric Spreader: A simple fabric spreader is a solid wooden plate, placed above the take down rollers & held in position by the fabric tube. Fabric Withdraw roller: This mechanism withdraw the fabric from the needles. Fabric winding roller: It is the last step of this machine. Winding the fabric in winding roller.